Rowers are versatile enough that you can do either a high-intensity or aerobic workout. One thing you should know right away is air rowers are kind of loud. If you’re the type that wants to watch TV, you better read subtitles or get a headset. Your neighbors in an apartment building might hear it, and definitely your family in the next room. I was kind of surprised how loud it was the first time I used one (a Concept2), given its popularity, but that’s just the way it is. If the noise is a problem for you, I’d highly recommend a water rower. Water rowers are considered excellent quality as well, nearly as good as air rowers at mimicking a real rowing experience, and you can watch or listen to anything without issues. We will have a separate article soon for the top water rowers out there. Keep an eye out! All air rowers have a damper setting on the fan. The higher the setting, the more wind resistance you create, basically blocking the airflow of the fan. Here I’m going over the top few air rowers so you can make the best buying decision between them. Concept2 offers a 5″ longer monorail as a $50 upgrade, accommodating users with up to a 41″ inseam. I can’t find it on their site, but they do have it. Concept2 rowers have a 300 lb user weight limit according to the European Stationary Fitness Equipment Testing Standard. However, for comparison with other brands I’d go by the 500 lb number. Plenty of heavy people use it, and there is no need for a special rower for heavy people. BodyCraft doesn’t use the convenient inseam method to rate the max user height. They simply estimate the max height as 6’8″. So here it is, the flagship rowing machine! The Concept2 model D rower has been the standard in Crossfit workouts for many years. It has become what all other rowers are measured up against. Therefore, most of what I go over in this article will be mostly comparing everything else to the model D.
The fact that it’s the standard is significant. Competitive rowers use it as a benchmark, and you just can’t reliably compare your performance numbers (speed or distance) on other rowers to this one. You will find it in tons of Crossfit affiliates, rowing clubs, and regular commercial gyms. They all know that serious rowers and athletes are used to the Concept2, so they kind of have to cater to the athletes by having this rower. Concept2 does make a couple other models, but the model D is the most popular and lowest priced. It’s crazy to think, but they’ve been making the model D since 2003. Granted, they upgraded it in 2006. You’ll notice on Concept2’s site that they sell a bunch of oars too. They aren’t a cardio equipment company. The brothers who founded the company were competitive rowers training for the Olympics and were serious about making good rowing products. That’s all they make. No treadmills, no bikes. They have stuck with what they are experts in. The Concept2 Model D is an easy choice if you’re a Crossfit affiliate, because athletes are so used to these rowers and are comparing their times against one another assuming that they are all using the same machine. Size Considerations: 8ft long, folds up pretty easily to stick in a corner. It’s only 57 lbs, making it possible to pick up and stick in a closet between workouts if you’re really short on space, or separate it in seconds into the two main pieces. Monitor: Every new rower includes their best monitor, the PM5. Programs, stats, wireless HRM compatible, everything you need. The USB port lets you download your workouts to a mobile app. It also has a race mode and connector so two machines next to each other can compete. Concept2 even keeps upgrading their software (it has an ethernet port so you can get updates). Of course, there is a “just row” option if you’re a newbie like me and don’t want to mess with any of that, you just want to warm up first, or you have a group timer going. Warranty: 2 years parts, 5 years frame, including commercial environments. That’s average for commercial-grade cardio equipment. The warranty is only as good as the company who offers it. Concept2 has been around since 1976, and they’re still doing great, selling tons of rowers every year and staying laser-focused on rowing only. There’s no reason to think they will disappear in the next ten years. Durability: This is one huge thing that Concept2 has going for them. They are known world-over to be rock-solid, lasting through for millions and millions (and millions) of pulls. When your warranty runs out you can still buy replacement parts and get tips from other users all over the internet. In most cases all you really have to do is lubricate the chain once in a while with the lube they include. That’s it. The fact that they only have a few models is good. You don’t have to worry about outdated models being unsupported. Price: $900. They have a lot of brick and mortar distributors but are really selective about who sells their rowers on the internet. As far as the second-hard market, you can find some on Craigslist. The used prices aren’t that much lower than new, for the simple fact that they’re so durable that they don’t depreciate in value. Both models are designed for heavy use. This is unlike other cardio machines that may have “home” and “commercial” models, where the home model is basically not meant to be used and will wear out if you stay serious with it, not to mention wobble and feel cheap and flimsy. Nope, in this case both are suitable for commercial use. They have beefed up the Model E a little bit. I think that’s mainly just because of the extra height of the Model E. So you could go with the E if you have serious mobility issues and have a hard time squatting down low enough to safely get on the Model D (or have clients who do). The VR500 introduced larger support legs and a third leg in the middle. The result is a really solid feel. It weighs 101 lbs, so that helps too. IR resistance control on the handle. Why isn’t everyone doing this?? 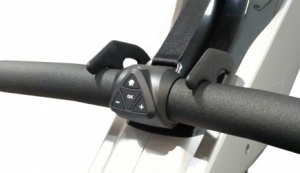 One nice feature of this rower is the resistance control. It’s actually an infrared (like a TV remote) wireless sensor on the handlebar, meaning you don’t even have to stop and get up to adjust it. As far as how it feels, the resistance is actually more consistent than a Concept2. On the Concept2, the pull becomes easier in the first part of the pull once you get going, cheating your legs for that portion of the pull. It’s possible to not allow it to do so, and just keep up the pressure/speed. However, on the VR500 you simply don’t get that kind of help. I would attribute this feature to the VR500’s combination of air and magnetic resistance. 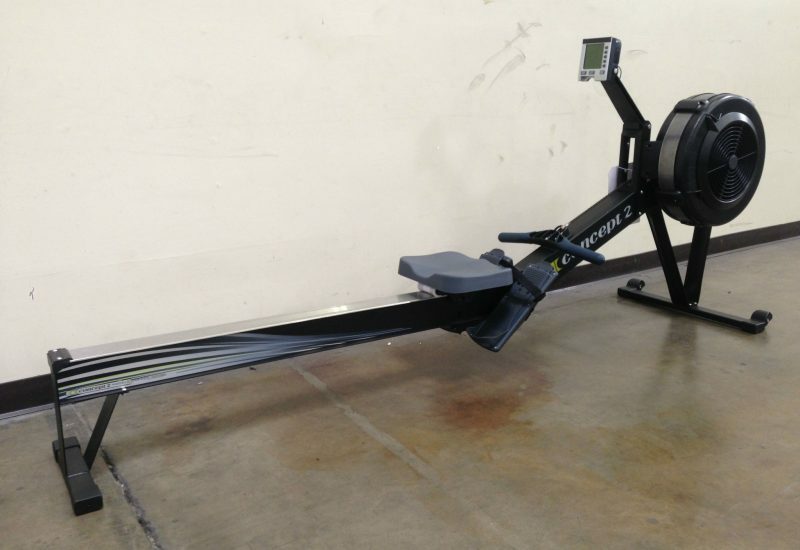 This is a belt-driven rower, rather than chain-driven like the Concept2. This makes it a bit quieter, and the magnetic resistance helps with that too. 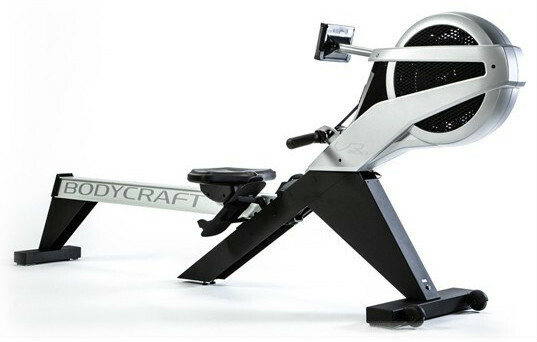 An all-magnetic rower is actually extremely quiet, the only noise being the seat sliding. But rowers built around primarily air resistance, like this one, provide better resistance than magnets, and BodyCraft made a good hybrid here. The fan does still make some noise. No avoiding that. If you have small kids, this one is a contender – A child safety lock is included for the folding position. Size Considerations: 8ft, just like the Concept2, and the seat is raised nearly to the same height as the Concept2 Model E to accommodate users who can’t squat down easily. One notable feature with the VR500 is its weight, 101 lbs. That’s 30 lbs heavier. Lots of steel in this thing. Monitor: Fairly advanced. No USB download, but otherwise all the options and trackers that people want. HRM compatible. No USB though. Warranty: The best of all of them! For residential use it’s lifetime frame, 7 years parts, 1 year wear, 2 years labor. For light commercial it’s 10 years frame, 3 years parts, 1 year wear and labor. Durability: It’s heavy and solid. All that steel helps. They were not looking to make a cheapo version of the Concept2. They were looking to make one even more heavy duty, priced be damned. Did they succeed? Well, the Amazon reviews since 2013 are very good. Price: $1,599, making it the most expensive air rower here. This is a luxury air rower, for people who can easily afford it and want the best heavy-duty air rower money can buy. It has oodles more tracking stats on the monitor than a Concept2. Stamina’s ATS 1405 air rower is the cheapest air rower of the bunch, no contest. I don’t like to recommend cheap equipment, but I’m including it here to give a fair shake because it gets such great reviews and is sold all over the place, and you’re going to come across it and be wondering about it if you do some shopping. It comes up as one of the first in the list on Amazon, among a couple other Stamina models. Overall the Stamina does get good reviews on Amazon. Amazon’s buyer base for fitness equipment is skewed towards people wanting to save money and less concerned on quality. More serious athletes and gym rats tend to buy equipment from specialty stores. Model Choices: Stamina makes several models of air rowers. The ATS 1405 is Stamina’s heaviest duty model and is still a lot cheaper than the Concept2 and Xebex. You don’t want to mess with Stamina’s cheaper models. Just don’t. Even this one is borderline for some people, and not good enough for others. Size Considerations: At 63 lbs it’s about the same as the Concept2. Overall the Stamina is about a foot shorter, although the range of motion on the monorail is a tad longer. Users with up to 38″ inseam can use it. The issue with it is it has a 250 lb weight limit. That means it’s definitely not for commercial use. The seat is really short off the floor, making it hard for people with mobility issues to use. Monitor: The monitor display is super basic. 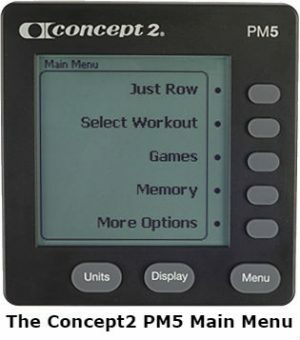 I’ve heard people complain that the Concept2 monitor doesn’t have a huge variety of options, but the Stamina display takes you back a couple decades. Warranty: They only give a 90 day warranty on parts. That’s a sign of a machine that isn’t made to last. Manufacturers set their warranty period by estimating how long the unit is expected to last before needing replacement parts in the vast majority of cases, and they set the warranty to end just before that. Or they do the reverse, engineering their parts weaker (cheaper) or stronger as necessary to get through the desired warranty period. If they have too many warranty claims their costs would skyrocket and they wouldn’t make a profit. Durability: At half the price I have to doubt it will prove to hold up as well as the Concept2. You might get lucky and find that with the Stamina you get a good deal and save a few bucks. If you’ve used a Concept2, you will notice right away that it does not feel the same. 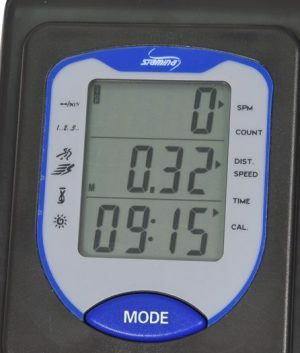 You should know that the fan on the Stamina wobbles as you row. Stamina is well aware of this. If it’s going into a commercial environment, I wouldn’t recommend the Stamina. You need a proven model that isn’t going to give your place a bad rep if it starts giving you problems. This one just doesn’t have the kinds of long-term reviews and known durability (or warranty, as mentioned) that the Concept2 does. If there’s a problem down the line – and that is more than likely under heavy use – you will end up spending more overall, going through a hassle, and losing clients. The difference in the Stamina X Air Rower (1412) and the ATS Air Rower (1405) is cosmetics. The rowers are the same size, and have the same mechanics. 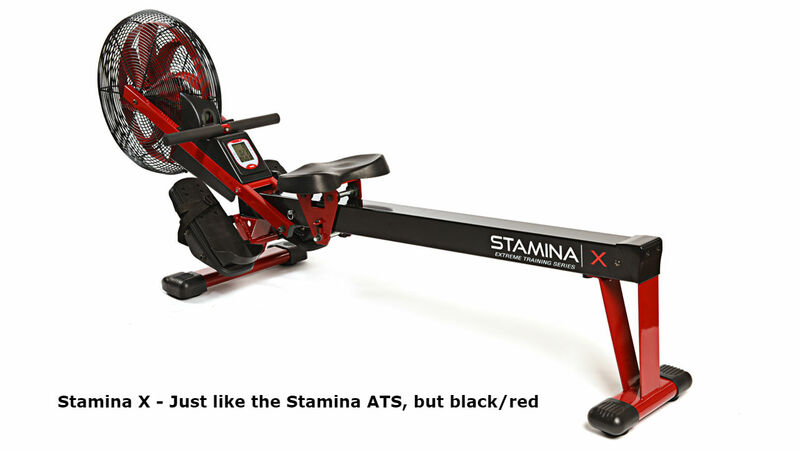 The Stamina X Air Rower (1412) is part of our Stamina X series where we have several products that are red and black. The model X is currently priced $70 higher on Amazon, so you’d have to really love the color. If you want the best: The BodyCraft VR500 meets or exceeds the Concept2 in all respects. Check out the Amazon reviews, and then pull the trigger. You’re going to be very happy. Commercial environments: Concept2 might be a better choice. Maybe a mix of model D and E, to accommodate people with mobility problems. People know it, they know their numbers, and they will instantly feel comfortable in your gym. But if your clientele are not already seasoned rowers, consider upgrading to the VR500. Traditional rowing: The Concept2 has a display that’s more helpful for people doing rowing training. For that kind of traditional use, you want to stick to the Concept2. Home: You might be able to get away with the Stamina if you don’t use it every day and you’re a small person who won’t put it to the test. Otherwise, either the Concept2 or VR500, depending on your budget. What rower are you leaning towards? Share below! This is was a great review, very much appreciated! It included the models I have been looking into and comparing. Looks like the Concept 2 will be getting a spot in my home gym soon! Victoria, I’m glad it was helpful! Let me know how it goes!